Durian Durian Durian.......... every where you go around Penang, you will easily spot the durian stall. Some are managed by chinese and some are Malay. If you are durian lover, you will love it. But some of my friends who are not the durian fans, hate it very much during the durian season. ^-^ But they have to bear the long season mainly from May to August. Ok now back to the place that I am going to introduce are located in Teluk Kumbar. When Steven told me about Teluk Kumbar, my mind only flashes with seafood. Teluk Kumbar Seafood and Hai Boey Seafood. ^-^ I really cannot imagine that we are having Tropical Foods for our dinner. 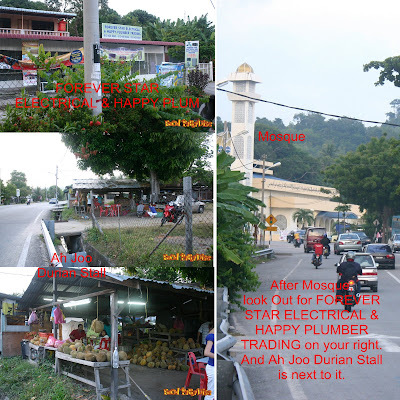 Direction to Ah Joo Durian Stall: Using Jalan Bayan Lepas to Teluk Kumbar and passed by a mosque shown as the photos below and look out for FOREVER STAR ELECTRICAL & HAPPY PLUMBER TRADING on your right. Then Ah Joo durian stall is just next to it. You can asked around the local to get direction if you are lost, the local know them well as AH Joo durian have been operating for about 17 years. Before the durian talk, first let talk about rambutan. Ah Joo Durian stall also sell rambutan. All the rambutan sold here are from Balik Pulau. When we arrived there, we saw lots of rambutan at the back of the car boot. And I can't resist to take some photos of it. And we get to tasted the rambutan too. And the rambutan tasted very juicy. 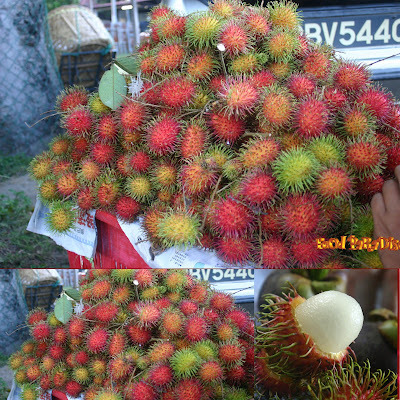 Rambutan are sold at the price of RM5 for 3kg and RM2 for 1kg. 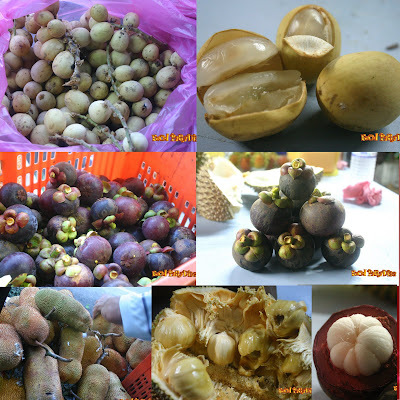 They also sold other local fruits such as langsat, mangosteen and cempedak. My dad loves langsat so much. Whenever he saw langsat, he always buy it. I tried one of the langsat and it tastes great. It cost RM2 per kg. Next is Mangosteen, I am not the fans of mangosteen but you can get 2 kg for RM5 and 1kg for RM3. They also sell cempedak. That's my SIL favorites. Too bad that she cannot have it this year since she is overseas. Every year she will buy cempedak and deep fried it. So I always have free juicy deep fried cempedak to eat during this season. Cempedak (red meat) cost RM3 for 1kg. Many types of durian sold in this stall. And above are the photos of the owner ~ Ah Joo. 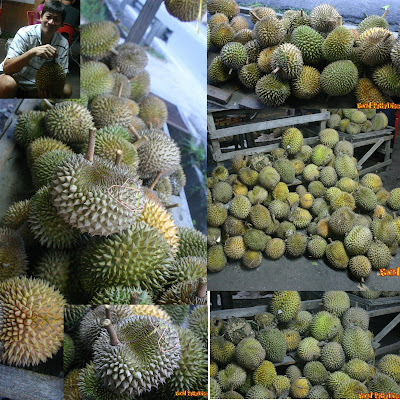 The boss is a very friendly person, just tell him what kind of durian you after, he will recommend you what to have. This type of durian tested very creamy, bitter and smooth. 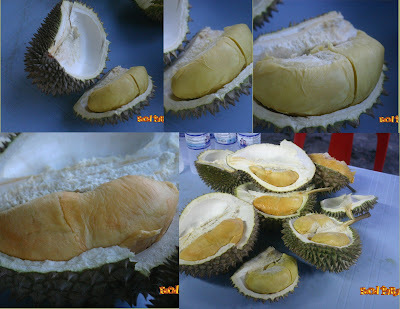 Furthermore, this is the cheapest durian we have tested among the rest. Although the durian is cheap but kunyit kunning has it own attraction. After the first bites, every one have the feeling like we are having some ice-cream except It is not being served in cold. And the textures of this durian is very creamy and soft. Hor lor.... ah...... it tested sweet in the outer layer but when you eat towards the end, it tested a bit bitter. Don't get me wrong with the bitterness. It is not like the bitter gourd. ^-^ It is just a way to describe it. For me hor lor get the top bitterness among other durians that we tested. As for Ang Hae, it tested mostly sweet and only a little hint of bitterness towards the end. And the seed is very small in size. It has a very creamy and silky textures. I still can recall when Cariso having Ang Hae, she was so excited and kept pointing at the durian. She falls in loves with it after the first bite. ^-^ I think most of us like it too with the smooth and silky textures but be warn it is very rich. The Ang Hae that we had cost RM16. Chae Pui is translated from "Hokkien". 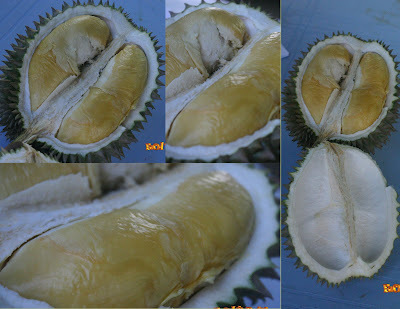 Normally, if you saw the durian flesh inside appear as green-based for Chae Pui, it usually tastes bitter. And it tested sweet from the beginning and towards the end, it turns a bit bitternes. The seed is very very small. The one that we had cost around RM8. As for the tatt kar chui, err..... you must be wondering what is that? Well, that's our reaction too. I think this is the name created by the owner and was told that it is a new species. The taste is very sweet. If you love sweet durian, this will suit you. All the durians sold from Ah Joo durian stall is from Gertak Sanggul, Penang. Apart from what we had, they also offerred other species such as Kor Teh, Kucing Tidur, Capri, Susu, D15, D2, COB, Ganja and Qi Xian Nyu. The business hours are from 10am -12 pm (open daily). You can contact Ah Joo @ 017-4222248 and Kelly @ 012-4531812 (For delivery). If you find Teluk Kumbar is so far for you, you can stop by their other branch @ Sg Nibong from 4pm - 10pm (nearby the kopitiam selling bak kut teh). Are you tempted with all the durian that we had? If so, you might gather some friends and families to have their durian buffet fest available @ RM25 per adult and RM15 per child. 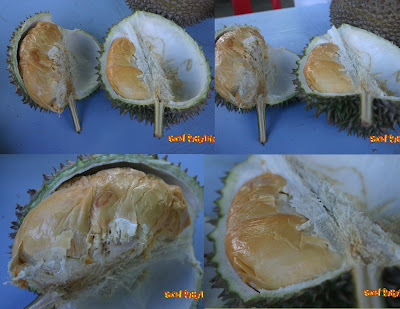 The next question is what will you be having during the durian fest? Well, you will be having all branded (include hor lor, ang hae) durian. If you are interested, please contact them for booking and please note that you must gather at least 5-10 persons. Another good news for you to share, that is they provide delivery service too. ^-^ Not fast food delivery, but durian delivery. They only deliver within penang island (not including Seberang Prai) and the minimum order is 10 biji. I don't eat Durian but I love Durian ice creams and candies. Mangosteen is my favorite fruit and Rambutan, my hubby's fave! The qty I had that day was the most I ever had per day. But now...I am thinking "Ei, may be I can start to eat like that once every two weeks uh?!" wah... finally the liu lian post is up. The description on your post is like expert leh. Durian is one of my fave fruits. Also like durian ice cream and cake. wat a nice durian trip!!! I love Penang durian!! Can never get those type of yellow big durian over here in Sarawak...Really want to have a bite on the tempting durian. Nice post! I learned a lot during the trip.